I got clued in on this from Think Progress, and when I went to the blogger who broke the story, it seems there are more and more examples turning up as web sleuths dig them out. Scroll down here at Nancynall.com for updates on the thievery. For years now, educators have been warning that U.S. society might soon be spending more on prisons than colleges. In five states, that moment has arrived, according to a report released Thursday by the Pew Charitable Trusts. Those states are (in order of spending the most proportionally on prisons in 2007): Vermont, Michigan, Oregon, Connecticut and Delaware. The state spending the least on prisons relative to higher education was Minnesota, where for every dollar spent on higher education only 17 cents was spent on corrections. The average for all states was 60 cents, nearly double the 32 cents spent 20 years earlier. Only three states saw gains in spending on higher education, relative to corrections: Alabama, Nevada and Virginia. The report, by the Pew Project on the States, urges state legislators to reconsider policies — such as mandatory sentences — that force states to devote funds to building and managing prisons. The period over the last 20 years in which many states imposed new sentencing rules and saw their prison populations swell has seen a growing gap between spending rates on corrections and higher ed. During the last 20 years, corrections spending has increased by 127 percent on top of inflation, while spending on higher ed has increased only 21 percent. Some regional variations are present — although higher ed spending appears to be always falling behind prison spending. In the Northeast, inflation adjusted spending increased 61 percent on corrections and dropped 6 percent on higher education over the last 20 years. In the West, spending on both increased, but by 205 percent for prisons and 28 percent for higher education. . . .
A new study of the Milwaukee school voucher program shows that children receiving publicly financed tuition at religious and other private schools perform no better academically than their peers in public schools. The results are surely disappointing for voucher supporters. Their premise rests on the assumption that children removed from “failing” public schools will fulfill their academic potential at private schools. The Milwaukee Parental Choice Program (MPCP) gives over 18,000 low-to-moderate-income students up to $6,501 to attend one of 120 participating schools. The Wisconsin legislature predicts the program will cost taxpayers $120 million this school year. So, do voucher supporters have a leg to stand on? Do vouchers improve students’ academic performance? The new study’s comparative analysis of standardized tests scores suggests not. The data show that children who transfer to private schools using MPCP vouchers fare no better than their peers who stay behind in so-called “failing” schools. “The baseline results indicate,” reports the study, “that MPCP students in grades 3 to 5 are currently scoring slightly lower on the math and reading portions of the [state scholastic aptitude test] than their [public school] counterparts.” Results from students in grades 6-9 were statistically equal. The report didn’t have good news for Milwaukee’s education system as a whole, either. Indeed, both public school students and MPCP students scored “well below the 50th percentile nationally.” Given the same standardized tests, both sets of students generally scored in the 33rd percentile, or below 2/3 of their peers nationwide. So, these similarly situated groups of students fared alike when compared to each other and dismally when compared to students from all walks of life across the country. Maybe the question isn’t how we can redistribute students in similar educational environments, but how can we improve similarly situated students’ over all living and learning environments. What about the Religious Right’s fondness for vouchers? I’ve always suspected their members are pro-voucher because they siphon money from public schools to their sectarian schools. The program is undoubtedly a boon to religious schools in the Milwaukee area. Eighty percent of participating schools, the Milwaukee Journal-Sentinel reports, are religiously affiliated. Perhaps unsurprisingly, a solid majority of those – 70 per cent – are affiliated with the Christian religion. The remaining handful is associated with other religions, including Islam and Judaism. Although researcher Patrick Wolf calls the project “the most comprehensive evaluation of a school choice program ever attempted,” he and his co-authors make clear that there is still much research to be done. This is the first of 36 reports scheduled to be released as part of the “School Choice Demonstration Project” and I suspect future data will corroborate those released his week. Then maybe we can make the debate less about free-market economics and religious education, and more about our children’s future. A D.C. Superior Court judge ruled yesterday that the public has no right to see the District's education spending plan for the coming fiscal year until Mayor Adrian M. Fenty submits it to the D.C. Council with the entire city budget. Before the mayoral takeover of the school system, parents and others could access the system's spending proposals in the fall and could lobby the elected D.C. Board of Education on funding and program changes. Their comments were taken into consideration before the board submitted its budget to the mayor. "I know the plaintiffs are frustrated," Assistant Attorney General Robert C. Utiger said. "In years past, they got information that they're not getting now, and that's a result of the change in the governance structure." The arguments in the case, in which parents and advocates sued Fenty and Schools Chancellor Michelle A. Rhee for not disclosing the fiscal 2009 education spending proposal, once again raised questions about the role of public input in the schools. This has been a recurring point of contention since Fenty assumed control in June. For example, the takeover law called for a chancellor selection committee, but Fenty named Rhee to the post without its assistance. Months later, when Fenty and Rhee announced school closings, parents and D.C. Council members were upset at not being included in the planning. At issue yesterday was whether Fenty and Rhee had to comply with the same laws that applied to the board. The board was required to release its budget before it was sent to the mayor, although education officials sometimes missed the submission deadline. In denying the requests from the advocates, which included ordering Rhee to release all her budget documents, Retchin said the schools takeover law "is a sea change as to how budget is created." But the judge commended the parents for their testimony, saying she was sensitive to their frustrations, and said they would be able to give their feedback to the D.C. Council once the mayor submits his budget, which is scheduled for March 20. But by then it wouldn't matter, said council member Marion Barry (D-Ward 8), who was granted special permission to speak because he was not a party to the case. "Once the city council gets the budget, of course they have a right to testify, but by then it's too late," Barry said. "It's very difficult for a parent to make that kind of change at that point. What they want is to have input before." . . . .
With 2,300,000 Americans in Prison, Will MS-NBC Develop An Incarcerated American Idol? Truly a shame. But what a business opportunity! And then there is the exploitative MS-NBC with its hours and hours each week of prison desensitzation programming. What's next? Televised waterboarding? How about an Incarcerated American Idol? I know of a ready-made audience of 2.3 million viewers. Sponsored by Honeybuns? I know I shouldn't give them ideas. More than one in 100 adult Americans is in jail or prison, an all-time high that is costing state governments nearly $50 billion a year, in addition to more than $5 billion spent by the federal government, according to a report released today. The ballooning prison population is largely the result of tougher state and federal sentencing imposed since the mid-1980s. Minorities have been hit particularly hard: One in nine black men age 20 to 34 is behind bars. For black women age 35 to 39, the figure is one in 100, compared with one in 355 white women in the same age group. . . .
. . . .Florida, which nearly doubled its prison population over the past 15 years, has experienced a smaller drop in crime than New York, which, after a brief increase, reduced its number of inmates to below the 1993 level. . . .
What does she demad? 100% proficiency! When does she demand it? Right now, today! JEFFERSON CITY - U.S. Secretary of Education Margaret Spellings was in Jefferson City Thursday to drum up support for keeping the No Child Left Behind Act. Spellings talked with Missouri education officials about the necessity for children to be able to count and read. She made it clear that she thinks the No Child Left Behind Act is working towards that goal. "I don't know about you, but I want my child on grade level right now today. 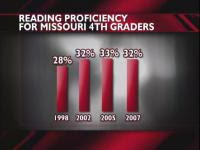 Right now today," said Spellings. . . .
Will Missouri Take a Leap Backwards on Teacher Quality? I have posted a number of pieces here on ABCTE, that ED-sponsored effort to gut professional teacher preparation programs and the teaching profession by offering a de-skilled and de-professionalized version of teachers with a credential earned solely on the basis of having a Bachelors degree and passing a test. No teacher training, no methods courses, no student teaching. If you doubt that ABCTE is aimed to bust the profession at any cost, read these linked posts above to see how then-Sec. Rod Paige approved ABCTE as a route to being "highly qualified" before ABCTE even had developed a single test. Ah, those were the days, weren't they! Well, they haven't gone away, I am afraid. At a time when teachers are leaving the profession because they refuse to abuse children with constant testing while neglecting real learning, at a time when those teachers are leaving the profession in the greatest numbers from the poorest schools that need the best teachers the most, at a time when politicians give constant lip service to a living wage for teachers and extra incentives for the best teaching in the most challenging schools, will the Missouri House go along with Senate to align themselves with another Bush Administration pet project to eviscerate the teaching profession, while turning their backs on the children who need the most highly qualified teachers? All in the name of addressing a teacher shortage created by an NCLB steamroller that has pushed out those teachers who refuse to become test factory guards. Will they approve a model of teacher non-training based on passing a Pearson-administered test and paying a fee? Will they tell poor parents that courses in child development, history of education, methods courses, student teaching, educational psychology, don't matter for teachers of their children? That their special needs child is taught by a teacher who became a special ed teacher by passing a test? Because surely if this scam passes the Missouri legislature, it will not be the parents of the middle class or the wealthy who get those teachers who become highly qualified by paying to pass a test. Here is a link to a story from the Post-Dispatch by Lee Logan, who was punked, I'm afraid, by someone who told him that ABCTE requires applicants to complete methods courses and 60 hours of observation to get their miracle credential. Chris Bale, with ABCTE, assures me that this is not a requirement, so bring your $750.00 test fee and come on down! JEFFERSON CITY — The Missouri Senate gave final approval to a bill that would make it easier for people to switch jobs to become teachers, after hours of debate Wednesday evening. Sen. Joan Bray, D-University City, had been postponing a final vote on the bill, saying she feared it would lower the quality of the state's teachers. "It's degrading to the teaching profession," Bray said. "We give up, as a state, our rights to determine the quality of our teachers in the system." The bill's sponsor, Sen. Luann Ridgeway, R-Smithville, said the measure addressed a critical teacher shortage.. . .
Washington — Education Secretary Margaret Spellings appeared before the House of Representatives Appropriations Committee today to deliver budget testimony, the last time she will do so in defense of a budget by President Bush. Both sides appeared to be glad it was over. Ms. Spellings endured a full two hours of criticism from both Democrats and Republicans on the panel’s education subcommittee, facing complaints of insufficient funds for dozens of education programs in Mr. Bush’s budget for the 2009 fiscal year, which begins October 1. In addition to complaining that grade-school programs such as those mandated under the No Child Left Behind law were being shortchanged, subcommittee members vented frustration over recommended cuts or minimal increases in such areas as the Carl D. Perkins Vocational and Technical Education program, support for historically black colleges, and programs that help college-bound high-school students. Ms. Spellings fought back by telling lawmakers that the administration, at a time of fiscal constraint, has been emphasizing larger-scale programs with a proven ability to work, such as Pell Grants, while cutting back on programs that federal analysts have found to be ineffective or too small to produce significant results. Education Week's incestuous relationship with the Washington education establishment has finally been called out in a strong letter that challenges their ideologically-driven treatment of public school issues in their annual trademark piece called Quality Counts. With the kind of unacknowledged advocacy that Ed Week engages in regularly, who needs an editorial page! The editors of Education Week claim to be objective journalists, but with their Quality Counts publication, they abandon objectivity and promote the standards-and-testing industrial school paradigm of No Child Left Behind (NCLB). In this context, they are no longer reporters; they have chosen to act as advocates. The editors of Editorial Projects in Education (EPE), the nonprofit that publishes Education Week, say that their mission is to “help raise the level of awareness and understanding among professionals and the public of important issues in American education. We cover local, state, and national news and issues from preschool through the 12th grade.” Education Week does not publish its own editorials, and it claims not to advocate for particular ideological or policy positions. Yet for more than a decade EPE has published its Quality Counts (QC) annual volume, purporting to assess the condition of American public schooling from a neutral and fair-minded vantage. Education Week has presented Quality Counts (QC) as if it were any other piece of journalism, that is, a piece of reporting. But a quick inspection of the 2008 volume reveals the dishonesty in this presentation. Quality Counts is not reporting in any normal sense of the word. Rather it is advocacy. Its assertions and conclusions often support particular policy positions. A few examples reveal these characteristics. QC embraces the position that state academic standards are a positive force in schooling (p. 45). This is an ideological position. QC offers no evidence to support this position. While most corporate and political leaders and many school leaders embrace this position, many educators and parents believe that standards constrain learning more than they enable it, that standardization of learning is an antiquated artifact of the 20th century that hinders creativity and the personalization of learning. QC accepts the criteria of an unpublished review of state standards conducted by the American Federation of Teachers, dated October-November 2007 (p. 45). This review judges state standards in terms of the following attributes: “clear, specific, and grounded in content.” Here QC is embracing an advocacy position of the AFT. To employ an unpublished document that cannot be reviewed is also bizarre for a publication that calls itself journalistic. QC awards positive scores to states that “assign ratings to all schools…” and “sanction low-performing schools. (p. 47). These are additional advocacy stances. There is no evidence that, for example, Florida’s crude A-F rating system does anything for children other than intensify test preparation. Nor does QC offer evidence that sanctioning “low-performing schools” does anyone any good. QC advocates for the ideological position that “all high school students…(should) take a college-preparatory curriculum to earn a diploma…” (p. 48) This is yet another value-based position, not reportage. While some politicians and educators support this goal, others note that a more differentiated high school curriculum is likely to better serve the very diverse high school population, particularly since a large percentage of new jobs in the decades to come will not require a college degree. QC awards points to states where “teacher evaluation is tied to student achievement” (p. 51). Such a policy is extremely controversial, given that many educators and analysts agree that efforts at this sort of simplistic cause-and-effect delineation both distort the complexity of causation in the schooling process and increase pressure for schools to become test preparation factories. These examples and others in Quality Counts display the profound ideological bias in this document. In this volume the EPE editors— Virginia Edwards, the editor and publisher; Gregory Chronister, the executive editor; Lynn Olson, the executive project editor; Karen Diegmueller, the managing editor; and Mark W. Bomster, the assistant managing editor—are not journalists engaged in good faith, objective reporting. They are powerful advocates for a particular school ideology: state standards, the simplistic labeling of schools based on narrow indicators and the “sanctioning of low-performing schools,” “teacher evaluation tied to student achievement,” and so on—seemingly the whole industrial paradigm of schooling, from Ellwood Cubberly to George W. Bush. If these EPE editors are not willing to publicly acknowledge their work as advocates in their yearly publication of Quality Counts, how can we trust the fairness of what they present each week in Education Week? We call on Ms. Edwards and her colleagues to rectify this situation in which Education Week pretends to be a neutral reporter but actually engages in advocacy. Two obvious remedies come to mind. EPE could cease to act as an advocate and thus cease to publish advocacy pieces such as Quality Counts. EPE could play by the rules just as every other newspaper does and establish an identified editorial function. Then it would need to separate its reporters from its editorialists. Even the Wall Street Journal and the New Hampshire Union-Leader meet this standard. It’s certainly long past time for Ms. Edwards and her colleagues to give up this charade of objectivity and play by the same journalistic rules as everyone else. SANDPOINT -- When President Bush signed the No Child Left Behind Act (NCLB) into law on Jan. 8, 2002, he was riding a tide of overwhelming bipartisan support from Congress, which passed the legislation by a vote of 381-41 in the House and 87-10 in the Senate. The Democratic chairmen of both the House and Senate education committees, Rep. George Miller and Sen. Edward Kennedy, stood behind the president at the signing ceremony. Dozens of Republicans hailed the law as the new benchmark for improving performance in public schools. Initial support was so widespread that then-Secretary of Education Rod Paige called the National Education Association (NEA) "a terrorist organization" when the union came forward with concerns about how the legislation would impact the classroom. Six years later, Miller has pledged to seek "significant revisions" in the law, while Kennedy finds himself in a very small minority fighting to reauthorize NCLB this year -- something even administration officials say is highly unlikely. Quoting current Secretary of Education Margaret Spellings, lawmakers have broken ranks with the president and now profess publicly that they merely "held their noses" when they voted for NCLB in the first place. . . .
Had Fenty and Rhee looked up the road in Philadelphia, they would have learned that charterizing already has been tried and found no better and more expensive. In Philly, the City has paid more to operate 40 corporate charters while they are producing no better test scores than the publics they were intended to replace. In some cases, scores are worse. But who needs empirical evidence when you have corporate socialism on your side. For Rhee and Fenty, however, nothing short of a public recall by voters or a citywide school strike will stand in the way of their privatization scheme, which is being directed on a nationwide scale by Gates and Broad billions. Rhee is on record as assuring Council that she will have control of the corporate welfare charters that she is now soliciting, even though there is clear evidence now that she can't keep up with her present duties, much less with the added burden of micromanaging 27 corporate welfare schools. Last week, for instance, she made excuses for deadlines missed on hiring an outside evaluation outfit for the schools and for being lax in bringing forth a budget. She is five months late on both counts, while managing to turn an expected surplus into a $100,000,000 deficit. Looks like she will need plenty more Broad-Gates bucks to keep this charade from collapsing before it can become institutionalized. Wonder if anyone in Congress is noticing what is going on? D.C. Mayor Adrian M. Fenty and Schools Chancellor Michelle A. Rhee are seeking educational management firms or universities to possibly run some or all 27 schools whose students chronically perform poorly. At a news conference yesterday with Fenty (D), Rhee said she has entered discussions with several nonprofit businesses and universities to work with the schools in the fall, although she only disclosed one, Mastery Charter Schools of Philadelphia. The Washington Post reported in November that she had approached Mastery, and Green Dot Public Schools of Los Angeles and St. Hope Public Schools in Sacramento, about managing some failing high schools. It would be the first time the school system employed a private firm to run a school. Outside organizations manage schools in other cities. In an interview, Rhee said she does not consider her proposed arrangement to be privatization because she would retain authority over what an outside partner would do. The organizations could "bring in their best practices, structures, schedules, curricula and themes," she said. "Ultimately, I have control over all the schools." 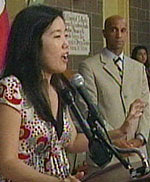 Rhee offered few details about the proposal. She said she has not determined how much a private-firm partnership would cost or how many organizations would run an entire school or programs in it. The District has hired such groups as America's Choice to provide extensive programs to improve schools, said Mary Levy, a local expert on school reform. . . .
RE "MAKE charter schools a priority" (Editorial, Feb. 22): Innovation and choice are great. The inequitable distribution of resources is not. While charter schools have an upside, they do not serve all students, including our most disadvantaged, disabled, and challenging children. When was the last time a charter school committed itself to a severely disabled student when the expense was extremely high? When was the last time a regular school kicked out a poorly performing student and sent him or her to a charter school? The Commonwealth should encourage the development of effective charter schools. It also must insist that regular public schools receive the funds required to allow them to be competitive while they remain committed to our most challenging students. Finally, stop saying charter schools are more innovative and successful. I've worked in schools serving the most challenging students anywhere, and I've been associated with charter schools that work hard to keep challenging kids off their rolls. Real innovation is found in schools where teachers develop the strategies required to educate extremely diverse students. The greatest success comes when you turn around unmotivated, failing students, not when you sustain students who are already motivated and capable. IT IS a mystery to me why the Globe feels it necessary to continually insult public school teachers. In your editorial championing charter schools, you end by labeling pre-1993 teaching as "torpid." Do you seriously believe that all public school teachers were uninspired paper pushers before 1993? Do you also believe that moving toward more standardized testing has made Massachusetts teachers more creative and effective? It's one thing to advance an educational agenda, but the Globe lowers the bar of public discourse when it resorts to sweeping put-downs of public school teachers across the state to make its point. Through ED grants, the Bush Administration has passed out free tax money in the hundreds of millions of dollars to school systems (click map to enlarge) to put in place drug testing programs that trample the privacy rights of students who are presumed guilty of drug abuse until proven innocent by random testing. This intensification of the Surveillance Society based on intimidation and fear is not only contrary of our history of individual rights, but it teaches acceptance of these intrusions without ever having a single lesson on them in the classroom. observed that mass suspicionless searches of groups had been found unconstitutional throughout most of the court's history, except in cases where the alternative—searching only those under suspicion—was ineffectual. She concluded that the school's policy was too broad and too imprecise to be constitutional under the Fourth Amendment. Will parents organize in Hillsborough to protect the privacy rights of their children? Will teachers make this intrusion a subject of discussion in U. S. Government class? Will a single student call the ACLU to inquire about filing a lawsuit? Or none of the above? Hillsborough High School students who play sports, join after-school clubs or want parking permits will now be subject to random drug testing to keep those privileges. Throwing out the old policy that only tested students if officials suspected drug use, the Hillsborough Township Board of Education voted 5-3 tonight for a random drug testing policy at the high school to go into effect this fall. Under the policy, students who participate in extracurricular activities or apply for a parking permit would be entered into a computerized pool that would randomly select names for testing during the year. Students who test positive would be required to meet with a counselor and would face suspension from their extracurricular activities. "We need to put some obstacles in place," said board member Wolfgang Schneider, who voted for the policy. "We have some in place already, but we need more because obviously kids have found a way to get around it." About 70 percent of the 2,500 students at Hillsborough High School would qualify for testing. The tests use either urine or saliva to detect drugs or alcohol in the system. Testing would cost about $9,000 a year, officials have said. To ease the financial burden, board members have said the district may apply for a portion of an estimated $12.5 million in federal funds to help offset the cost. WASHINGTON—February 20, 2008—Last summer, a groundbreaking report verified what many in the education and policy communities had long suspected: that a majority of the nation’s school districts were increasing time spent on reading and math in elementary schools since the No Child Left Behind Act became law in 2002, while most of these districts cut back on time spent on other subjects. Today, a follow-up report issued by the Washington, D.C.- based Center on Education Policy provides an unprecedented look at the magnitude of those changes. In its earlier report, CEP found that a majority of school districts—62 percent— had increased time for English language arts (ELA) and/or math in elementary schools since school year 2001- 02. Meanwhile, 44 percent had increased time for ELA and/or math at the elementary level, while simultaneously cut ting time from one or more area s including science, social studies, art and music, physical education, recess, and lunch. CEP’s new report, Instructional Time in Elementary Schools: A Closer Look at Changes for Specific Subjects, examines the size of the shifts in those districts, in order to determine just how extensive the changes were. According to the report, districts increasing time for ELA and math had done so by an average of 43 percent , or about three hours each week. To make room for the added time for ELA and math, districts reducing time in other areas averaged cuts of about 32 percent across those subjects, nearly 2.5 hours each week. Some of the districts reduced their time in one subject, while other districts decreased instructional time in several areas. In 2000, Citizens for Quality Public Education published "Senate Bill 186 and The Truth About Colorado Educational Reform," a report warning about the consequences of grading schools based solely on standardized test scores. Under the leadership of Gov. Bill Owens, SB 186 was passed anyway. At that time, my daughter, Sophie, was 4 months old. The following year, the federal No Child Left Behind was enacted. Since then, everything the report cautioned concerning high-stakes testing has come to pass: narrowing curriculum, negative school climates, disenfranchised teachers, frustrated parents, and children who quickly losing sight of the value of their own education. • Dropout rates have increased significantly. Since the implementation of high-stakes testing, including NCLB and SB 186, Colorado's dropout rate has nearly doubled, from 2.4 percent in 2003 to 4.5 percent in 2006. • Students now have fewer course electives. A survey by the Center on Education Policy found that since the passage of NCLB and high-stakes testing, 71 percent of the nation's school districts have reduced the hours of instructional time spent on history, music and other subjects. • Recess has been reduced or canceled. According to the National Parent Teacher Association, nearly 40 percent of U.S. schools have either canceled recess or are considering doing so because of the time constraints of standardized testing and budget cuts. Over the past 12 years, DPS has decreased physical education time by an average of 40 minutes per week. • More than a dozen schools have been closed down. High-stakes testing promised to close the achievement gap, but instead districts are closing schools predominantly in low-income areas. Cole Middle School is on its third conversion in a decade, now that KIPP has abandoned its students. Before SB 186, Cole was a thriving school for the performing arts. By all indicators, the state's version of school reform has not worked. Even test scores have remained mostly flat, despite the millions spent on McGraw-Hill tests, curriculum guides, and after-school tutorials. Littleton and Cherry Creek, some of the highest performing districts in the state, haven't been meeting federal guidelines for "adequate yearly progress." The biggest complaints of parents include large class sizes, too much homework, insufficient time for our children to eat lunch or play outside, decreases in programming, and stressful learning environments. These complaints are echoed in the appallingly high turnover of teaching staff. Assessments aren't the problem; high-stakes testing is. And there is a difference. In very simple terms, the problems we are facing today are the result of an education system that has been redesigned to serve the state. We need a system that serves our children. Standardization and high-stakes testing rest on a paradigm of uniformity and conformity. If we graduate an entire generation proficient on a single skill set and mindset, we will have failed because our future will depend upon adaptability, imagination and collaboration. The danger of this game is that it reinforces the misconception of a failing educational system, when what we really have are failing priorities and policies. We can no longer afford to defer the responsibility of our children to a one-size-fits-all test, or "all or nothing" reforms. This session, Sen. Mike Kopp will introduce Sernate Bill 61, requiring exit exams for 11th-graders. Sen. Peter Groff is sponsoring Senate Bill 130, establishing a two-tiered system for accountability while maintaining the real barrier to innovation: CSAP. It didn't work in Florida and it won't work in Colorado. Quality doesn't rely on doing the wrong thing better. Before adding more layers of legislation, our government representatives first need to clean up the mess they've already created. Sophie is 8 years old now; our children simply can't afford to wait any longer for the legislature to come to terms with its mistakes. Angela Engel is project director for the Children's Action Agenda. The General Assembly is flirting with abandoning a landmark federal law that governs schools in the United States. The decision could make Virginia the first state to set a deadline – summer 2009 – for planning a pullout from the No Child Left Behind Act, which ties billions of dollars to federally mandated testing standards in public schools. State politicians have balked at some of those standards in the past few years. Gov. Timothy M. Kaine has signed bills asking the U.S. Department of Education to waive parts of the federal law. Most of those exemptions were granted, but the notable ones that have not been approved frustrate educators and annoy legislators. This year, some politicians want to up the ante. Both the Senate and the House of Delegates are working with bills that say that if the state’s waiver requests aren’t granted, Virginia’s Board of Education would develop a plan to withdraw from NCLB by July 2009. Delegates have approved the bills, even adding language to one seeking to recoup federal tax money if the state withdraws. Senators keep deleting the deadline, leaving the bills – SB490 and HB1425 – more open-ended. Legislators from both chambers will have to negotiate a compromise for a bill with a deadline to make it to the governor’s desk. Kaine hasn’t said what he would do with the measure, which could cost Virginia more than $350 million a year in federal aid. Del. Steve Landes, R-Weyers Cave, the bill ’s sponsor in the House, said that now is an opportune time to take a stand, with the NCLB law up for renewal and a new president taking office in January 2009 . The brinkmanship in Virginia is typical of the friction NCLB has caused nationally, said David Shreve, federal affairs counsel for education for the National Conference of State Legislatures. Shreve said he thinks Virginia would be the first state to set a formal deadline to pull out of the law. . . . If state lawmakers want a textbook case for tougher academic and financial oversight of charter schools, they need look no further than the now-failed Lynacre Academy. As far back as 2002, the southern Dallas charter school for at-risk children inflated attendance figures to the Texas Education Agency. Under pressure, it repaid the state $200,000. Three years later, state auditors found more inaccurate attendance records and evidence that the school still owed about $750,000. For two years, TEA haggled with the school over the money. Lynacre filed bankruptcy in the fall and closed last month, leaving TEA and other creditors seeking payment and students scurrying for a new school at midyear. Lynacre had missed academic targets six consecutive years, one of only two charter campuses in the state with such an abysmal record. It's a stunning and avoidable failure that must not be allowed to continue. Last session, state Sen. Florence Shapiro sponsored a bill to make it easier for Texas to close low-performing charter schools and send more money to successful charter schools. The measure passed the Senate but never reached the full House, the fifth time in the past four years that a charter reform bill hit a brick wall in the House. Mrs. Shapiro blamed the bill's demise on "colleagues in the House with ties to low-performing charter schools." A main opponent was Rep. Sid Miller, R-Stephenville, whose wife founded and operated a troubled charter school in Stephenville. . . . In this stormy political season many topics have been touched on by the presidential candidates: the Iraq war, the economy, health care, etc. However, the one topic that has been left off the radar is education. Unfortunately, this subject is in dire need of full coverage by the press and our candidates because of the negative impact of the current law on our children in the classroom. If parents truly knew the research that has been released, but never given its just due, their initial decision to support the federal No Child Left Behind act would continue to fade. As an educator of ten years, I can attest to the dramatic changes that I have seen in students over that period of time. Many students, were, for the most part, creative thinkers with independent minds that strove to come up with answers that made sense to them. They also showed an ability to approach a problem from various angles and come up with a solution that was correct, while still mastering standards. In this era of standardized testing "accountability", these precious elements gave begun to fade dramatically. I see students who wait for answers to be given to them, are less confident in their thinking capabilities, are less able to follow simple instructions, have much less patience, and even have shown an increase in behavior and health problems. Discussions amongst other educators from Fresno area districts, as well as nationwide, have illuminated the same traits. Some teachers have told me about the removal of blocks from their kindergarten classrooms because it was told to them that, "Blocks won't be on the test." In other schools, playhouses have been removed citing the same reasoning, yet that reasoning defies all research and logic which states that children need socialization skills in order to be complete learners. The Center on Education Policy has shown that 44% of public schools have cut back on recess time, science and social studies in the name of testing practice. This evidence is a concerning and tangible reality. A new study by researchers at Rice University and the University of Texas-Austin finds that "Texas' public school accountability system, the model for NCLB, to be a dismal failure. Each year Texas public high schools lose at least 135,000 youth prior to graduation -- a disproportionate number of whom are African-American, Latino and English-as-a-second-language (ESL) students." The study shows "as schools came under the accountability system, which uses student test scores to rate schools and reward or discipline principals, massive numbers of students left the school system." Here in the state of California, the drop out rate has increased 4% since the inception of high stakes accountability. Dr. Stephen Krashen from USC has pointed out that overall student performance has flatlined and even dropped in most grade levels since the law has been in place. What can our community do about this? Many parents feel powerless in the face of lawmakers that make such drastic decisions about public education. However, not all have been silent. Parents in Chicago are planning on keeping their kids home in the face of their unjust local tests, and in Michigan the city of Pontiac's public schools have recently won a judgement against the NCLB law. Here in California, Lindsay schools have turned down funding to protect quality teaching practices that have been threatened by a myopic focus on standardized testing. There are many other situations nationally that display parent disenfranchisement with the current education focus. It is the LAW in California that parents can choose to opt their children out of testing, if they see it fit. Schools are supposed to inform them of this during the year, but many fail to do so for fear of repercussions by the federal government. Even State Superintendent of Instruction Jack O'Connell has stated, "I want to remove the penalty against schools where parents do not want their children to participate in state testing," O'Connell said. "It concerns me that the Bush Administration apparently does not support the rights of parents in this regard, because NCLB unfairly penalizes those schools where parents exempt their children from testing." If you are interested in understanding more about the impact of the NCLB law on students and want to know more, please attend the Chavez Literacy Conference at Fresno State on March 28-29th. Parents have rights and should use them without fear. Let's strive to protect our public education system. A DuPage County school district could be the first in Illinois — and perhaps the nation — to refuse to administer mandatory state exams to students who haven’t yet mastered English. The boycott by Carol Stream Elementary District 93 would be an act of civil disobedience against the state’s decision to force English learners to take the same tests as their fluent peers. Nearly 10 percent of the district’s 4,300 students were categorized as having limited English skills in 2007. The federal No Child Left Behind law requires that all public schools annually test all students in select grades. Politicians and educators throughout Illinois have aggressively opposed the move, predicting it will cause districts to fail and face serious sanctions under the federal accountability law. A group of Chicago parents plans to keep their children home during the March testing, while local school officials have petitioned state lawmakers for a one-year reprieve for English learners. And, some other superintendents say they also would consider a boycott. But District 93 administrators are the first school employees to say publicly they will not administer the test to some students, Illinois State Board of Education spokesman Matthew Vanover said. Indeed, the district could be the first in the nation to mount this type of challenge, though others have rejected federal money in order to opt out of the high-stakes tests. A Wisconsin teacher made national news last year when he protested the emphasis the law places on standardized testing by refusing to administer the exams — for a single day. Threatened with termination, he proctored the exams the second day. “The frustration is widespread, but this action is unique, to the best of my knowledge,” said Robert Schaeffer, public education director for the National Center for Fair and Open Testing. Schaeffer said his group supports parents, students and educators who take such stands, but does not push them to do so because of the risks. Vanover said he couldn’t speculate on what penalties the state might hand down. Though the law says the test must be administered, it doesn’t stipulate that students must finish the test. U.S. Department of Education spokesman Chad Colby said a boycott could jeopardize the district’s federal funding. And, he said, it would undermine the law’s intent, which is to hold schools accountable for what students learn. District 93 received about $631,000 from federal sources during the 2005-06 school year, slightly more than 1 percent of its total revenue. Other suburban school officials said they would consider a boycott as they continue to weigh their options. The Marquardt Elementary District 15 school board in Glendale Heights has authorized Superintendent Loren May to make the final decision on whether to administer the tests. Guess what? Play is required for the healthy development of children. Imagine that. Clearly the way that children spend their time has changed. Here's the issue: A growing number of psychologists believe that these changes in what children do has also changed kids' cognitive and emotional development. We know that children's capacity for self-regulation has diminished. A recent study replicated a study of self-regulation first done in the late 1940s, in which psychological researchers asked kids ages 3, 5 and 7 to do a number of exercises. One of those exercises included standing perfectly still without moving. The 3-year-olds couldn't stand still at all, the 5-year-olds could do it for about three minutes, and the 7-year-olds could stand pretty much as long as the researchers asked. In 2001, researchers repeated this experiment. But, psychologist Elena Bodrova at the National Institute for Early Education Research says, the results were very different. Sad because self-regulation is incredibly important. Poor executive function is associated with high dropout rates, drug use and crime. In fact, good executive function is a better predictor of success in school than a child's IQ. Children who are able to manage their feelings and pay attention are better able to learn. As executive function researcher Laura Berk explains, "Self-regulation predicts effective development in virtually every domain." According to Berk, one reason make-believe is such a powerful tool for building self-discipline is because during make-believe, children engage in what's called private speech: They talk to themselves about what they are going to do and how they are going to do it. "In fact, if we compare preschoolers' activities and the amount of private speech that occurs across them, we find that this self-regulating language is highest during make-believe play," Berk says. "And this type of self-regulating language… has been shown in many studies to be predictive of executive functions." And it's not just children who use private speech to control themselves. If we look at adult use of private speech, Berk says, "we're often using it to surmount obstacles, to master cognitive and social skills, and to manage our emotions." Unfortunately, the more structured the play, the more children's private speech declines. Essentially, because children's play is so focused on lessons and leagues, and because kids' toys increasingly inhibit imaginative play, kids aren't getting a chance to practice policing themselves. When they have that opportunity, says Berk, the results are clear: Self-regulation improves. "One index that researchers, including myself, have used… is the extent to which a child, for example, cleans up independently after a free-choice period in preschool," Berk says. "We find that children who are most effective at complex make-believe play take on that responsibility with… greater willingness, and even will assist others in doing so without teacher prompting." Despite the evidence of the benefits of imaginative play, however, even in the context of preschool young children's play is in decline. According to Yale psychological researcher Dorothy Singer, teachers and school administrators just don't see the value. "Because of the testing, and the emphasis now that you have to really pass these tests, teachers are starting earlier and earlier to drill the kids in their basic fundamentals. Play is viewed as unnecessary, a waste of time," Singer says. "I have so many articles that have documented the shortening of free play for children, where the teachers in these schools are using the time for cognitive skills." It seems that in the rush to give children every advantage — to protect them, to stimulate them, to enrich them — our culture has unwittingly compromised one of the activities that helped children most. All that wasted time was not such a waste after all. More than one in nine of Minnesota's charter schools have taken advantage of a loophole in state law to buy or build their own buildings using public money intended to help them lease space. The loophole allows charter schools to bypass the voter approval that traditional school districts need before buying or building schools. The charter school lease aid law was passed in 1997 to help charters rent space and compensate for the fact those schools can't levy taxes or use bond measures to buy property. Of the state's 180 charter schools, more than 20 have used lease aid to get a permanent site. From PACT Charter School in the northwest metro area to Paideia Academy in the southeast, charters are setting up affiliated nonprofit corporations to own the buildings, financed with corporate bonds, leased back to the schools and paid for with state lease aid. And an expanding lease aid budget, set against a general education fund struggling to keep up with inflation, could trigger a debate between legislators seeking to rein in the lease aid fund and charters who say it is still a poor substitute for direct ownership of a building. . . .
. . . .Rep. Mindy Greiling, DFL-Roseville, chairwoman of the House K-12 Education Finance Division, was one of the lease aid bill's sponsors along with current Department of Education Commissioner Alice Seagren. Greiling said she still supports lease aid, but added, "Any time you give a group an inch, they can take a mile." Ownership of buildings was an unintended consequence of the law, she said. Seagren, a Republican who served from 1992 to 2004 in the Legislature, said charter schools owning buildings through nonprofits is a mechanism for charters to obtain suitable space when none is available for rent. She also pointed out there has been no legal challenge to the practice. But a 2003 legislative auditor's report recommended lawmakers review it. Deborah Parker Junod, project manager of that audit, said charter schools that use nonprofits to own buildings are "clearly circumventing the law." . . . . In what might be the biggest "bait and switch" in many years, Gov. Sonny Perdue's three-year-plus effort known as Investing in Educational Excellence (IE2) has been translated into legislation sponsored by House Education Committee Chairman Rep. Brooks Coleman (R-Duluth). Launched as a way to revisit the 20-year-old Quality Basic Education funding formula for the state's public schools, the IE2 task force spent more than three years gathering information, traveling the state, holding public hearings and visiting schools. Their work, they told us, was to develop new cost models based on best practices in the elementary, middle and high schools. The questions they were asking seemed reasonable: What are the current best practices in our schools? What does it cost to operate such a school? What should be the state share and what should be the local share of those costs? They were also going to re-examine the funding partnership between the state and local districts, a relationship that has grown increasingly tense as the state share of education funding has retreated substantially, forcing local systems to seek additional funding to replace vanished state funds. Some months ago, the IE2 group released a cost model for the elementary schools. While not perfect, the model seemed to be a substantial improvement from current practice. We praised the work of the task force at that time. Education leaders across the state anxiously were awaiting the cost models for the middle and high schools as well as the other items on the IE2 agenda such as recommendations for innovations in funding high-cost programs for special education students or students from impoverished backgrounds. Instead, Coleman's legislation, touted in a news release issued by Perdue's office, "sets up a system of performance contracts that allow for greater flexibility in return for increased accountability." Say what? Who changed the subject? How did we go from funding to flexibility? There is already plenty of charter school (read flexibility) legislation on the books — most of which we have supported. The "flexibility" Coleman's legislation refers to would give districts a choice of the current local-state relationship, a charter-schools relationship similar to legislation passed a few years ago, or a systemwide charter system based on the 2007 bill passed at the behest of Lt. Gov. Casey Cagle. Flexibility in how districts spend state funds that have been decreased over the past four years by more than $1.6 billion is a pretty thin product for a three-year "investing in educational excellence" task force. What investment? While overall funding for student growth and the faculty required to teach the added students has increased, virtually all other aspects of education funding have been neglected or substantially reduced. We are operating our schools in 2008 using a funding formula created in the mid-1980s. Does this make sense to anyone? Through IE2 and Coleman's legislation, Perdue and his task force have not only "kicked the can down the road" for more than three years, they have, with the collusion of Coleman — at the 11th hour — changed the subject. Our public schools, and the 1.6 million students who attend them, deserve better. Senator Obama said this week that he is open to supporting private school vouchers if research shows they work. "I will not allow my predispositions to stand in the way of making sure that our kids can learn," Mr. Obama, who has previously said he opposes vouchers, said in a meeting with the editorial board of the Milwaukee Journal-Sentinel. "We're losing several generations of kids, and something has to be done." Education analysts said Mr. Obama's statement is the closest they have ever seen a Democratic presidential candidate come to embracing the idea of vouchers. Vouchers are taxpayer-funded scholarships that allow families to opt out of public school and use their government-allotted education dollars to attend a private school instead. They are despised by teachers unions, powerful players in Democratic politics. When Mr. Obama filled out questionnaires for both national teachers unions last year, the American Federation of Teachers and the National Education Association, he told the unions that he did not support vouchers. But on Wednesday Mr. Obama opened his remarks to the Journal-Sentinel's question on vouchers by saying he had to admit that he has been a "skeptic" of vouchers. He said he was astonished to learn that a voucher program in Milwaukee had never been tested in a longitudinal study to find out whether it had helped children or not. "If there was any argument for vouchers it was, all right, let's see if this experiment works, and then if it does, whatever my preconceptions, my attitude is you do what works for the kids," Mr. Obama said. . . . When Randolph Chancy took a job with Miami-Dade County Public Schools last year, he expected teaching would be a labor of love. But he wasn't prepared for just how much labor would be required. For Chancy, the $38,000-a-year salary he collects from the district is not enough to make ends meet. So every day after school, the science teacher races to a pathology lab in Miami Lakes, where he works a second job as a lab technician. ''It's crazy. It's all day, every day: Go! Go! Go!'' sighed Erin Hanson, a third-grade teacher at Sawgrass Elementary in Sunrise who also works two nights and Saturdays selling purses and accessories at the Kate Spade store in the Sawgrass Mills Shopping Center. ``You run yourself ragged.'' . . . . This school year, it’s costing the Pennridge School District more than $600,000 to pay for the 70 students living in its borders who attend charter schools. Next year, that cost will top $900,000. “We’re spending money for programs we have no control over,” said Superintendent Robert Kish. Control is just one grievance officials in school districts have with charter schools. Words like accountability and funding inequity quickly follow suit. . . . While state statutes require state tests to be administered, there are few specifics related to requirements of children to take them in elementary school. Of course, in the most repressive regimes like Louisiana and New York City that require students to pass exams to be promoted to the next grade or to graduate, opting out may have consequences for which parents and students should be aware. Most state statutes, however, are silent on the issue of opting out. The most reliable way to find out your local policy on parental rights and student testing is to read the local board policy or call the Superintendent's Office and ask. In terms of teachers getting in trouble for encouraging such action, I think that teachers must be guided by an ethical commitment to do what in the best interest of children, or at least to certainly allow no harm to come to children. If violating this ethical imperative is the only way to stay out of trouble or to keep your job, then I would suggest that the system does, indeed, need replacing--and that acts of protest and civil disobedience are not only justified but called for. "Just following orders" as a reason to act in a morally reprehensible manner has not been a viable excuse ever since Nuremberg. Any person who does not recognize this truth has traded the mantle of educator for the handcuffs of the prison guard, and they are no better than the abusers whose policies are causing damage to children now and in the future. Here is some good info on resistance offered by Mothers Against WASL. The law states that public schools are required to administer the assessments to students enrolled in the specified grades and subjects, the assumption apparently being that participation on the part of the student or approval on the part of the parent would not be an issue. Because it is not specifically addressed in the legislation, agency policy adopted after the question arose has been that students may refuse to participate or their parents may refuse to have their children tested. The policy further requires the school to request that the refusal on the part of either the student or parent be put into writing by the parent and kept on file at the school or district office. It is also recommended that the parent be requested to include the reason for not wanting the child tested. If any parent is unwilling to put the refusal in writing, the school should document that the request was made but the parent would not put the refusal in writing. This refusal will not avoid any consequence for not testing, such as WASL scores on transcript or failure to graduate. Because the number of students meeting, exceeding, or failing to meet the standards is based upon enrollment, the percentages for the schools and districts are impacted by refusals. The significance of the impact is proportional to the number of students that should be tested vs. the number of those same students who were not tested for whatever reason. This aligns with the federal “No Child Left Behind” legislation. The Washington State Legislature has dictated that all schools teach to the Essential Academic Learning Requirements. Schools and teachers are not required to create a distinct curriculum for students whose parents have asked not to be tested on the WASL. Schools are not obligated to provide an alternate curriculum or other lessons to students refusing testing during the time the WASL is being administered. My student, ____________________________, will not be participating in WASL testing during the current school year. I understand that it is my legal right as parent/guardian to opt ______________________________ out of state testing. I also understand that the school will provide appropriate, alternative learning activities during testing times. I do not want any record of WASL testing in my student’s permanent file. It is unfortunate that the school will receive a zero for my student’s untaken test, but this is the responsibility of the Washington State Office of the Superintendent of Public Instruction. Please contact OSPI with your concerns regarding this policy. Latino Parents in Chicago to Lead Testing Boycott? What most parents don't know is that they have full legal authority to keep their children home, rather than subjecting them to the abusive tests that the numbskull politicians keep shoving on children and parents and schools. While Wall Street, Congress, and the White House remain unaccountable to anyone for an unnecessary war, for illegal spying, for the mortgage crisis, for sanctioned torture, for the ecological disaster, for increasing poverty, for jobs exported, for crushing national debt, for no health care for 50 million Americans, for segregated schools, for crumbling national infrastructure, for unprecendented corporate-government corruption, and for oppression of the poor and minorities, they expect Latino children in Chicago to be accountable for tests they cannot read, just as they expect poor children in Camden to perform the same as the middle class children in Cherry Hill. Could any situation be more insane?? The only way parents are going to get any attention to their plight is to boycott the tests. Keep your children home, and this NCLB child abuse, along with the testocracy that it has inspired, will collapse like a house of cards. Parents truly have the power to end the madness. Angry Chicago Latino parents threatened Tuesday to keep their kids home on test day next month if state education officials insist on giving students who are still learning English an achievement test in English. Facing threats of federal sanctions, state officials were ordered last October to give the same state tests native English speakers take to some 60,000 Illinois public school kids who haven’t yet mastered English. They were joined by State Sen. Iris Martinez (D-Chicago), who said the federal government was “trying to take this program [bilingual education] away from us’’ by forcing children to take a test in English before they are fluent. “This is a way of attacking children who don’t understand the language,’’ said Martinez, who is pushing a resolution to delay the test for a year. Previously, Illinois kids in bilingual education programs for less than three years took an alternative state test in English. But last October federal education officials ruled that test did not meet federal No Child Left Behind standards. They ordered Illinois bilingual education students who have been in public schools for more than a year to take the same tests native English speakers take, starting March 3. Parents raised their hands in agreement Tuesday when asked if they would keep their children home rather than have them take the new test. “We have to push them to pay attention and if this is the way to get them to pay attention, I will do it,’’ said Leticia Barrera, parent of a Monroe Elementary third grader. Barrera’s daughter, Arely, said she did poorly on practice tests, and is worried she’ll tank the real thing. “I’m scared,’’ said Arely, age 9. “I think I’m going to fail. I’m not prepared to do the test.’’ . . . .
Evolution has been a cornerstone of biology for more than 100 years, but don't try to tell that to many of the thousands of people who posted comments on Florida's Department of Education Web site. "The last time I went to the zoo, the monkeys weren't evolving into man," read one comment. "Evolution is not proven and we should not brainwash our children with this concept," stated another. The State Board of Education is to vote Feb. 19 on controversial new science standards that for the first time would require teaching evolution in Florida's public schools. The new standards are intended to beef up lackluster science education in schools. The standards list evolution as one of 18 "big ideas" students must understand by the time they graduate. They call evolution the "fundamental concept underlying all of biology" and say it is "supported by multiple forms of scientific evidence." But those academic phrases have ignited a theological controversy across the state. . . . . The Post and Courier has recently carried plenty of good news about the Charleston Charter School for Math & Science. The past few months have seen exceptionally ample reminders of the invitation for applications and ample coverage of the first "lottery" to select students. On Friday, Jan. 25, it was reported that state Rep. Chip Limehouse had filed a bill that would forbid school districts from charging charter schools rent for lease or use of a building owned by a school district, noting that his action was spurred by the decision to charge rent to the Charter School for Math & Science. On Tuesday, Jan. 29, it was reported that the Charter School had hired a principal and two administrators and that 47 percent of the initial enrollment forms returned were for minority students. On Wednesday, Jan. 30, there was editorial praise for Mr. Limehouse's bill and for school board member Gregg Meyers' statement that he is ready to vote to rescind the school board's decision to charge rent to the charter school. The unprecedented wave of positive reporting on the Charter School for Math & Science has been admirably crafted, but I did want, in the midst of the positive media spin, to note a few other things. It should be noted that should Mr. Limehouse's legislation passes, the result would be an unmitigated disaster for public education in South Carolina. School districts that are already stretching scare dollars to build and equip traditional public schools would be required to stretch them even farther to cater to charter schools — not just by providing available buildings, but possibly by providing everything from science labs to stadiums. My hope is that even if Mr. Limehouse wishes to cater to charter schools that will only serve a fraction of our state's children, he will also work for adequate and equitable funding for every school district in South Carolina. . . .
. . . .It should also be noted that the reported 47 percent minority enrollment in the Charter School for Math & Science is not official evidence of diversity because the school district has taken no steps whatsoever — beyond tying the building rent amount to diversity — to track diversity at the Charter School for Math & Science. The founders of the charter school have, in fact, indicated in the past that they are resistant to any objective measure of diversity being a requirement. . . . 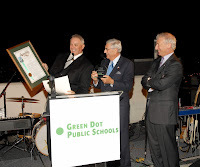 Apparently that most recent$12,000,000 gift by Eli Broad to Green Dot Public Schools, Inc. was not enough to provide the EMO with school facilities, even though it obviously was enough to buy a 4-3 vote by LAUSD to force their own public schools to turn over public school space to Green Dot's corporate charters. Never mind that public school teachers will lose their rooms and have to teach from carts. And never mind that there is no research to demonstrate the veracity of CEO Steve Barr's public relations campaign lies that his Green Dots are performing miracles in LAUSD. The corporate takeover is simply being ignored, even by national newspapers like USA Today, who tout Green Dot, Inc., even with zero evidence of school effectiveness. Will someone have the guts to stop or even question the corporate takeover of American schools How about you, Hillary? Barack? More Los Angeles campuses will have to make room for charter schools, even if some teachers are forced to give up their classrooms and become roving instructors, under a litigation settlement approved by the Los Angeles Board of Education on Tuesday. The agreement requires the school district to inventory all properties and work directly with charter schools to find space on or off campus. Charter advocates say finding and paying for facilities is their No. 1 challenge. The settlement signals "new cooperation" toward serving all students -- whether they attend a charter or a traditional school, supporters said. "We share the pain of overcrowding equally," said Caprice Young, president of the California Charter Schools Assn., a party to both suits. "We in the charter school movement recognize that the Los Angeles Unified School District has a space crunch, and we all have to work together to create great facilities for all kids." Agreeing to the possibility of roving instructors, called "traveling teachers," was perhaps the major -- and most controversial -- concession by the school district. Because of classroom shortages, these teachers move from room to room with cartloads of materials throughout the day, an intensely unpopular assignment. The school district could provide no figures on how many teachers travel, but their numbers have declined dramatically in recent years with the construction of new schools and declining enrollment. Two lawsuits were filed in May under a state law that calls for public school campuses to be "shared fairly." Charters are independently run public schools freed from many provisions that govern other schools, including adherence to union contracts and district curriculum. The school board approved the settlement by a 4-3 vote after a closed session. Board member Richard Vladovic dissented, recalling the time he "traveled" as a middle school teacher early in his career. "I couldn't spend the time I wanted to focus on my lessons and on meeting with students and counseling them," Vladovic said. "I felt my students got cheated." He also worried that traditional schools would lack needed space and flexibility to improve their schools. Before the litigation, the two sides had been split on facilities, especially with L.A. Unified dealing with its own classroom seat crunch. Currently, 143 district schools operate on a year-round schedule, and 42 have a shortened school year. Even after the district completes a $12.6-billion school construction program, adding about 165,000 seats, officials say some schools will remain overcrowded. At newly constructed district schools, officials have rarely considered charter school needs, except in rare cases when seats are left over. And no existing school was to be significantly hindered by a charter. Moreover, the review of available space was partly an honors system, with principals disclosing whether or not they could house a charter school. Over the last decade, charter schools have operated out of churches, high-rises, warehouses and portables slapped down in parking lots. They are supposed to model academic innovation, but officials also saw another benefit. "Charters could go into storefronts," said board member Julie Korenstein, who voted against the settlement. "They were increasing space so our [traditional] schools would become less overcrowded. Putting them back on our campuses does just the reverse." L.A. Unified now oversees 125 charter schools with 47,000 students, more charters than any school system in the nation. About a dozen are in district-owned facilities. These include three of the 10 small high schools operated by Green Dot Public Schools, which filed the lawsuits along with PUC Schools, six charter parents and the charter association. "In other cities, people offer facilities if we come," said Green Dot founder Steve Barr. "We should be looking at this strategically -- together." The settlement aims at that goal, substituting a five-year plan for a cumbersome, almost ad hoc process that gives charter schools little advance notice on availability, and then guarantees space for only one year. The agreement, which leaves many details to the future, relies much on good faith. Negotiators for the charter schools said they made numerous concessions and that the terms of the agreement do not represent their view of state law. Board member Yolie Flores Aguilar said the settlement protects "our schools from staying on or going back to [year-round schedules], making sure we don't bus kids out of their neighborhood or put students back in portables." Charter advocates said they expected the agreement to open up many more new and existing campuses to charter schools, which is precisely what critics worry about. "This is the kind of thing that makes everyone in the school business crazy," said Scott Plotkin, executive director of the California School Boards Assn. Charter schools are "the interlopers here. They land from outer space, get kids to sign up and now they say, 'We want special accommodations made for us.' "
The agreement still needs the formal approval of other parties to the suit, including parents and the boards of the charter schools. Labels: charter schools, Green Dot Charter Schools, Inc. Lawmakers bristle over dictates to the hinterlands from the state folks in Atlanta. Except, of course, when the lawmakers themselves are the ones in Atlanta trampling local control. And that's exactly what the House Education Committee did this week when it endorsed a charter school law that allows applicants to bypass local school boards and pitch their case to a new state seven-member commission nominated by the governor, lieutenant governor and speaker and approved by the state school board. HB 881 represents a frontal assault on the constitutional powers of school boards and a shift of critical decision-making to a political commission that will have no firsthand knowledge of the district's needs, the local system's own development plans or whether the charter applicants have any credibility or relationships in the community. Nor will the commission have any accountability to local voters, who, if angry over their school board member's resistance to charters, could always vote the rascal out of office. Those voters will have no recourse against the actions of this commission, which will operate in de facto anonymity, most likely in a nice suite of state offices in Atlanta. As the sponsor of HB 881, state Rep. Jan Jones (R-Alpharetta) maintains that the Legislature had to intervene because too many school boards were "indifferent, disinterested and occasionally hostile to charter schools." Of 28 charter school applications last year, she said local school boards approved only two. A charter school is a public school that operates according to a contract that's been approved by a local board of education. In exchange for great flexibility, the charter school must meet the performance objectives spelled out in the charter or face closure. Nationwide, there are 4,000 charter schools, serving a million students. Georgia has 71 charter schools, four of which were approved by the state board of education. Some local school boards have indeed treated charter schools as unwashed and unwelcome cousins and thrown too many obstacles in their path. However, some charter applications deserve rejection because they weren't ready or weren't realistic. It's also worth noting that the same Legislature now lamenting how traditional public schools resist innovation has imposed so many constraints on school systems that they can't even change brands of paper clips without triplicate request forms. Those House members eager to strip school boards of control should consider their response if the federal government, citing the General Assembly's dangerous dereliction of water conservation, waded into the issue, created the action plan and handed the bill to the state. The steam coming out of lawmakers' ears would tarnish the Gold Dome. In a great act of chutzpah, the General Assembly is wresting control from school boards at the same time it's dumping more of the financial burden for education on them. The message to the local districts seems to be "pay more, say less." Nor have lawmakers considered any of the nuanced and contradictory evidence about the efficacy of charter schools. Yes, there are wonderful charter schools in Georgia, although some of the most impressive were existing public schools that converted to charter status. DeKalb's Chamblee High School and Cobb's Walton High excelled long before adding the word "charter" to their names. One of the four House Education members who voted against HB 881 because of its disregard for local control, state Rep. Mike Keown (R-Coolidge), said, "Anything about charter schools is going to pass this year. It's like a runaway train." And that's the real problem — the Legislature's single focus on charter schools as the key to improving education. Without a review of the research, lawmakers have adopted the position that Georgia's arid education landscape will bloom anew by seeding hundreds of new charter schools. Rather than getting into the hard work of reforming schools, lawmakers are settling for renaming them. In a new book due out next month, "Spin Cycle: How Research Gets Used in Policy Debates, The Case of Charter Schools," Columbia University professor Jeffrey R. Henig cautions, "Policy-makers need to know that charter schools are neither a panacea nor poison. ... If charter schools have consequences — good or bad — they are incremental, less powerful than consequences flowing from other variables, and contingent on circumstance, policy design, administrative implementation, and local context." No matter if they are traditional or charter, effective public schools must have adequate funding, well-prepared and smart teachers, passionate leaders, targeted help for struggling students and a hands-on, relevant curriculum. Until the General Assembly and the governor are willing to furnish those critical needs, schools in Georgia can be called anything they want — except successful.